Scientists have come up with an artificial muscle that, in many respects, responds like natural muscle. These artificial muscles could enable humanoid robots to move and act with more grace, possibly mimicking real humans. The artificial muscle seen here performing biceps motion in order to lift a skeleton’s arm to a 90 degree position. Credit: Aslan Miriyev/Columbia Engineering. Before robots or androids really permeate society, designers have to make them more human-like. This is not only to make them more familiar or less creepy, but also to improve safety. When working side by side on an assembly line or at home, you really don’t want to injure yourself every time you come across a robot’s metal rods. Ideally, robots that interact often with humans ought to be covered in soft, artificial tissue. With this goal in mind, a team led by Aslan Miriyev, a postdoctoral researcher in Columbia University’s Creative Machines Lab, developed a synthetic muscle that pushes, pulls, or twists in response to heat. Experiments suggest the artificial muscle is capable of lifting 1,000 times its own weight. Even more remarkably, it can expand 15 times more than natural muscle and is also three times stronger. Beyond robots, the 3-D printed artificial muscle might see a better life augmenting movement for people with disabilities. Since it’s made from biocompatible, relatively inexpensive materials, the artificial muscle could be surgically embedded or used as an exoskeleton prosthesis. No external compressor or high voltage equipment is required, as in previous muscles. “Our soft functional material may serve as robust soft muscle, possibly revolutionizing the way that soft robotic solutions are engineered today,” said Miriyev. “It can push, pull, bend, twist, and lift weight. It’s the closest artificial material equivalent we have to a natural muscle. Soft actuator technologies typically use pneumatic or hydraulic inflation to expand elastomer skin with air or liquid. The compressors or pressure-regulating equipment, however, prevents the kind of miniaturization we’d like to see in a humanoid robot that moves gracefully and fluidly like a human would. To get around bulky actuator equipment, the scientists designed a silicone rubber matrix which expands or contracts as ethanol enters or exits micro-bubbles embedded inside the material. 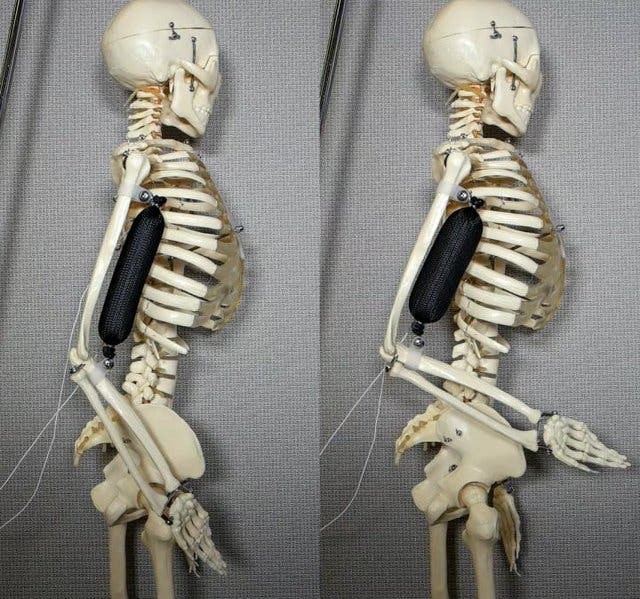 The artificial muscle is actuated with a low-power 8V resistive wire. When heated to 80°C, the artificial muscle could expand to up to 900% its initial size, allowing it to perform motion. The team now plans on improving their design. On the drawing board is replacing the embedded wire with conductive materials, accelerating the response time, and increasing the artificial muscle’s shelf life. Ultimately, machine learning algorithms will take control of the muscle’s contractive motion in order to replicate natural movement as closely as possible.